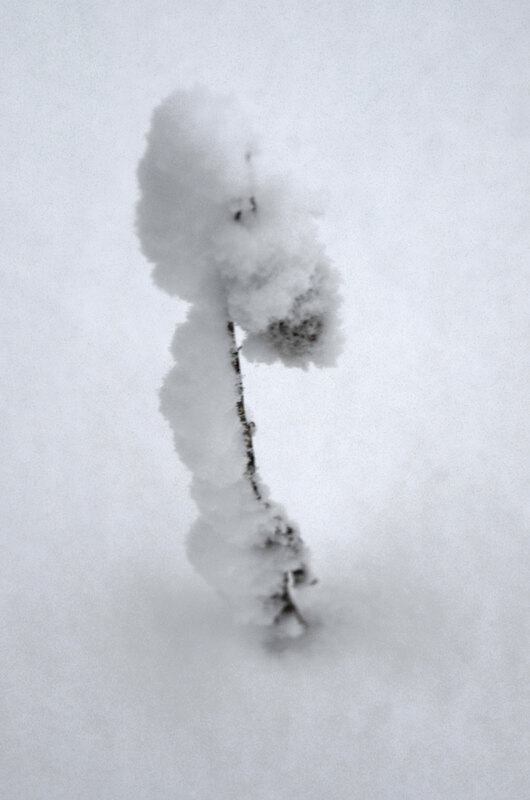 We were gifted with a significant amount of snow yesterday, perhaps more at once than other snowfalls this winter. It’s been a bit of a lean year so far. You can tell it hasn’t snowed for a while when some of your neighbours appear genuinely excited to be shoveling their driveways. I was also happy to be out in the falling snow. It was warm enough to stick to you thoroughly as you trudged along. All the gritty greyness covered up. I should, in fact be out skiing right now but I am nursing a knee injury from skiing in less than ideal conditions. Cross country skiing in the hilly back country of Gatineau Park can be pretty challenging and when you are somewhat limited in skill (clumsy) it can mean a lot of…crashing. Back to yesterday. Towards the end of the day I was making pictures in low light. 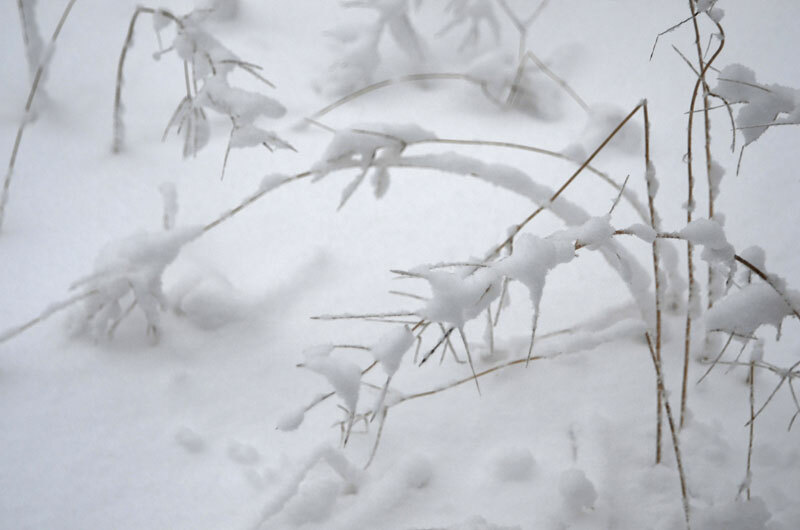 They are underexposed and nothing special but somehow they captured that feeling of intimacy that fresh snow seems to evoke. When I looked at them I could picture that snow-covered girl, the one kneeling in the softness trying to steal the last bit of light. 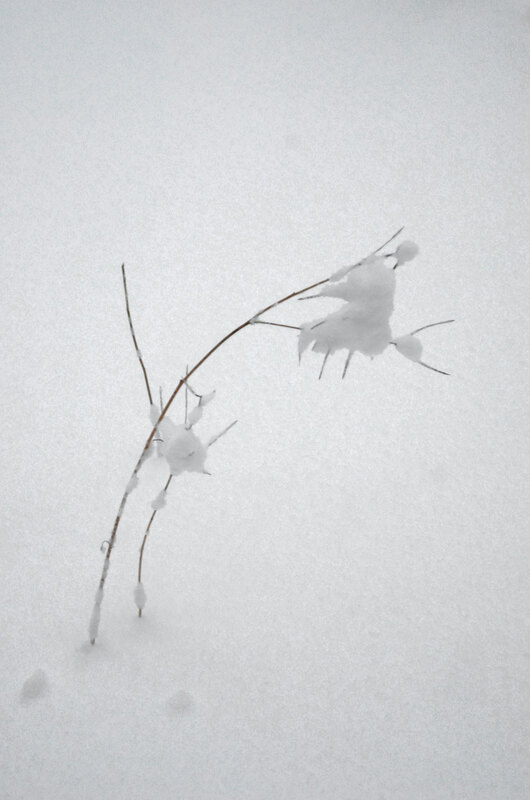 Sinking into the fading white on white, pink cheeked, and for a moment, almost graceful. I especially like that first one (well, I like all of them). It’s like the snow has just flung itself about like some kind of passionate installation artist with a severe dose of joie de vivre and a not insignificant case of laissez faire. I’m glad you think so Isobel, thank you. Karen, I have only looked at a few of your posts and was so impressed that I decided to follow. Thanks for sharing them. Nice to hear Wally, thank you so much! The light is perfect. Makes me feel wrapped in snow. Beautiful. Take care of your knee. Beautiful Karen; it’s like a fairytale wonderland! It did feel like a wonderland. It’s amazing how weather can be so transforming. You’re right – these do capture a feeling of intimacy. They trigger a response in me that I can’t put into words, it’s emotion and feeling. Isn’t photography a wonderful thing? Good stuff Karen! It’s nice to hear that Steve, that another person can get the sense of place and experience you are trying to convey. Yes photography is wonderful! 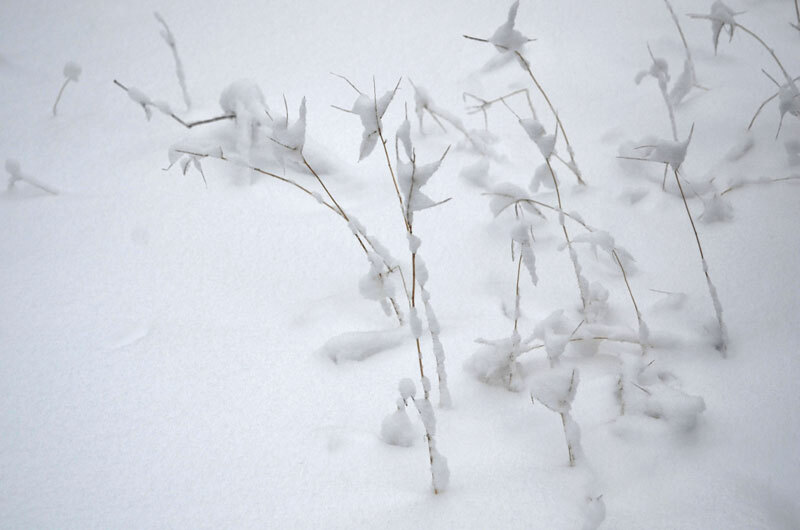 so pretty – the fragility and delicacy withstanding all that snow! Sorry about your knee injury 😦 Get better soon! Thanks Marina, I think the Bikram yoga is helping! Oh, that’s so good to hear! Be careful though, with the heat. It’s so easy to overstretch, as I learned the hard way. so beautiful to gaze at! Mimo, thank you, I appreciate your comment. So lovely; so jealous rain, wind, sun and snow but too warm for the snow to stick. Well I hope you get a snow that “sticks” Shez. Thank you. Breathtaking in their beauty……..just too lovely for words. Awe, how kind Helen, thank you. Nice series. The last one is my favourite. The lines in it work. But also the exposure. That is exactly as it was! Sorry to hear of your knee injury. If it helps any, I was in the park yesterday and found the skiing slow – still nice to get out and enjoy the powder, but me and my boards were not in agreement! Maybe today we will work as one! I might get out on the groomed trails, I was just looking at your latest post – you are an inspiration for sure! Gorgeous and delicate..nice to hear your words too – I really can see the pink blooms in these..
“White on white” was said to be the end of all art. When you put white paint on a white canvas, what else is there left to explore? Everything, as you clearly captured in these stunning photographs. Excellent work, Karen! I like them, Karen! 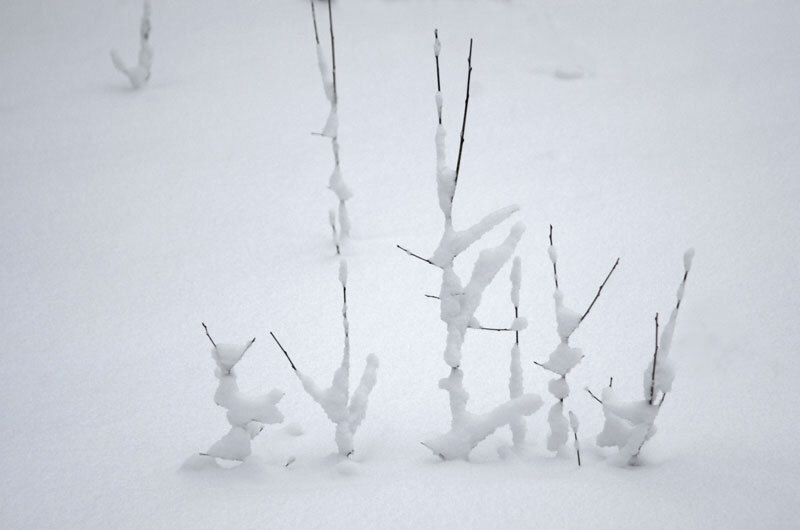 Images #2 and #3, in particular, seem to be stick-and-snow characters, engaged in joyous, acrobatic, dance. Hope you’re feeling 100% again soon! So beautiful and so white! I love how every series of photographs you create, allows our imaginations to follow along with it… I see forms that almost dance even though I know they are frozen solid in their position and in the snow. 🙂 Maybe that’s just me but I definitely see an anthropomorphic theme carried out in your work. No matter what the subject. Great post and great photographs! I disagree with you when you say these are nothing special, Karen! I think they are very special photographs, and once again a superb set! Exquisitely simple and delicate in their content and colour, they give me a feeling of peace and relaxation and pleasure! Thanks, Karen! 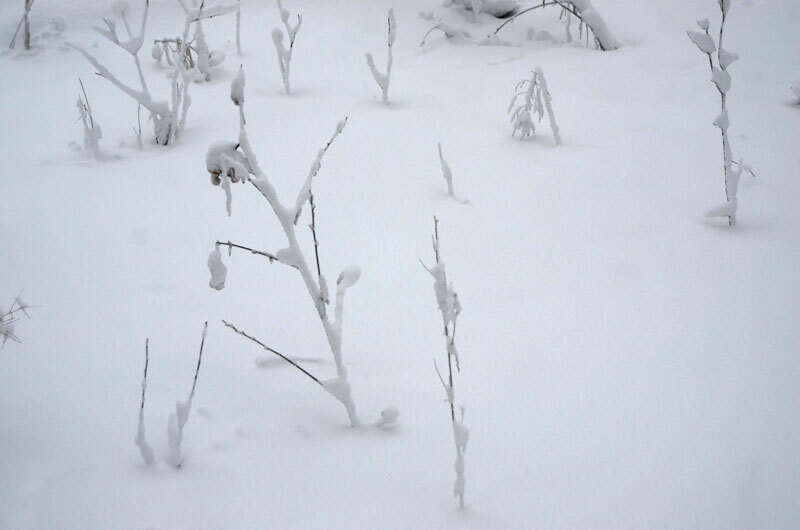 Global warming doesn’t seem to be affecting you very much yet, with all the snow you are having! Our seasons are gradually, and noticably moving towards being the same!